Hey Everyone! 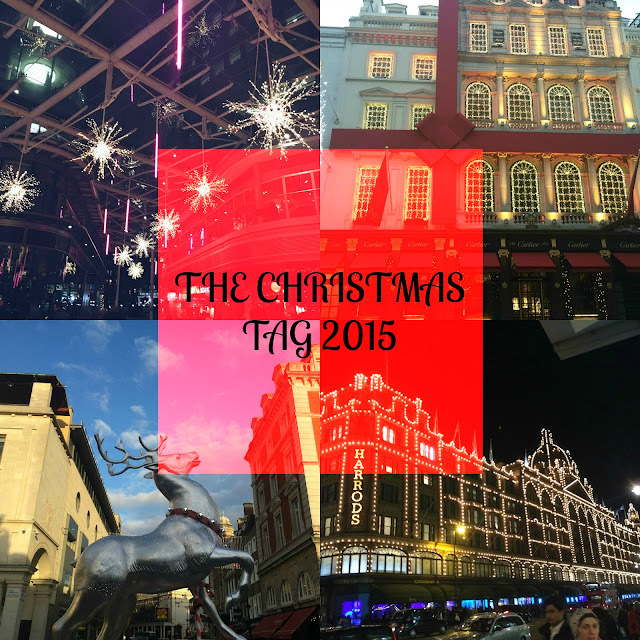 So blogmas day 5 is officially here! Sorry for not uploading a post yesterday but I was so busy at work and so tired so I decided that I would take one day off. I've forgiven myself though as I did start a day early. However now the right posts will be posted on the right days so I hope you enjoy it! Today I thought I'd do a tag post. These are becoming more and more rare in the blogosphere at the moment but I thought a nice Christmassy one would do nicely as a blogmas post. ENJOY! This is an extremely hard question as I have so many. For me Love Actually and The Holiday have to be two of my favorites. However after watching it for the first time recently 'Elf' is going into my top 5 by a mile! I can't believe I put it off for so long! I also love Miracle At 34th Street. I just feel so Christmassy when watching it. I also love The Polar Express! So so good! Oooo this is a tough one. When I was younger I always used to open it on Christmas Eve however as me and my brother have got older my parents have worked shift work nearly every Christmas so we tend to open them in the afternoon or in the evening when everyone is sitting in front of the TV relaxing. This year me, my mum and my Dad are all working so we'll probably wait till Boxing Day. Christmas was always amazing in my family as kids. My parents always used to put fake snow everywhere and there was always tons of presents under the tree, wine and a mince pie on the table...that was always half eaten and a little bit empty. It was always just so lovely to come downstairs and see all these things in the morning. This year I'm going to make it my aim to bring it back! I absolutely love all the chocolate that you get around Christmas but when it comes to the main Christmas lunch/dinner I absolutely love cranberry sauce and apple sauce. I know you can get these things all year but Christmas is the one time of the year when we tend to eat it the most and I just absolutely love it. I also love croquet potatoes. Mince pies and Stollen don't go a miss at my house on Christmas either. Let's be honest though, all food at Christmas is amazing. Minus brussel sprouts of course! This is a tough one. I always received such amazing presents as a child. One of my absolute favourites however was a doll. Her name was Amazing Amy and she was just such an amazing doll. She was basically my own child. She would go to see same time as me then wake up early in the morning and I had to feed her food and she would tell me if she liked it or not. She had two outfits a really pretty pink and white polka dot dress and pastel green pyjamas. She was just amazing and I still have her somewhere as well. The funny thing about getting this present is that exact same year I kept on saying I was too old for dolls. I'm glad my parents didn't listen! This changes every single year. I absolutely love the smell of the Christmas dinner being cooked, or anything that smells like cinnamon. Last year I was a massive fan of the Christmas Cookie scent from Yankee Candle as well. This year I am a massive fan of spiced apple scents. I absolutely love the Christmas scents from The Body Shop this year. Yes!! This is when I would lock myself in my room, put on Christmas music and wrap up all of my presents. I also write all my Christmas cards for my friends and neighbours on Christmas eve as well. One of my favourite Christmas films is 'A Christmas Carol' with Jim Carrey so when it is time to go to bed I always stick this film on and I just absolutely love it. It gets me so excited for the next day! This has changed throughout the years. We have always used angels however they have been different angels. When my brother and I were at school we used to make Christmas decorations all the time and these always included angels that we had made. However we have had our Christmas tree for years and the top actually wobbles a lot meaning that the angel dive bombs off a lot. This year I want to try and get a proper Christmas Angel to go on top of the tree. This was my Grandma's favorite decoration when it came to trees and I've been thinking about her a lot recently so I think this will be quite special. As a kid what was the one crazy, wild, extravagant, gift you always asked for but never received? This question makes me feel ungrateful haha! To be honest I never really asked for anything. I guess as a kid the one present you always ask for is a Pony. I never got it and I think at 24 I can kiss all hope of having my own pony goodbye. What is the best part about Christmas for you? Getting to spend time with family and friends and showing them how much you love them. I also love the cold weather and sometimes snow and just generally being happy and having an amazing day with the people you love. I also love having my twin cousins around the house. Christmas is always better with children around the house. It's hard not to have a lovely time! I love doing tags like this! I've kept it quite short and sweet so if you're looking for a tag to answer as part of Blogmas then this one will be perfect. I'd love to find out more about what Christmas is like for other people around the world/in the UK as we all celebrate in different ways and I always think this can be very interesting. How are all your Christmas preparations going? Great post, girl. I love Home Alone 1+2 and Elf !! I could watch them all year round. Blogmas Day 18 | FleurDanielle Turns 3!